From the fall harvest we acquire pumpkins, squash, apples and so much more. I try to make the most of this harvest as I possibly can. As we head off to the apple farm, making 2-4 trips each fall, I pick up bushels of apple seconds, squash and pumpkins when they are not growing in my own garden. I usually pick up a few squash on each trip and 2-4 pumpkins each year. Working with pumpkins is not really all that hard. I think the reason I at first procrastinate is that I love how a pumpkin looks on my fall table setting. The second reason is in the awkwardness in having to cut it in half in order to bake it for what I use it for, yet once I start, the process runs along smoothly. This morning, I have baked pumpkin in order to make puree for pies, soups and breads. In addition I decided to try my hand at making seasoned pumpkin seeds. Usually I just save a few to try planting the following year. Place my two pumpkin halves cut side down on the aluminum that is over the baking pan, You can remove the pumpkin stem if you wish, I tend not to. By cooling, the pumpkin get softer, making it easier to scoop out and work with. 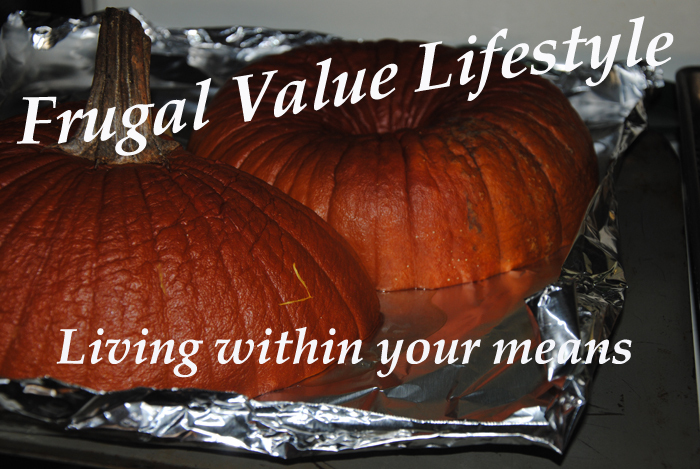 Scoop out the pumpkin from its shell and place in food processor or blender. 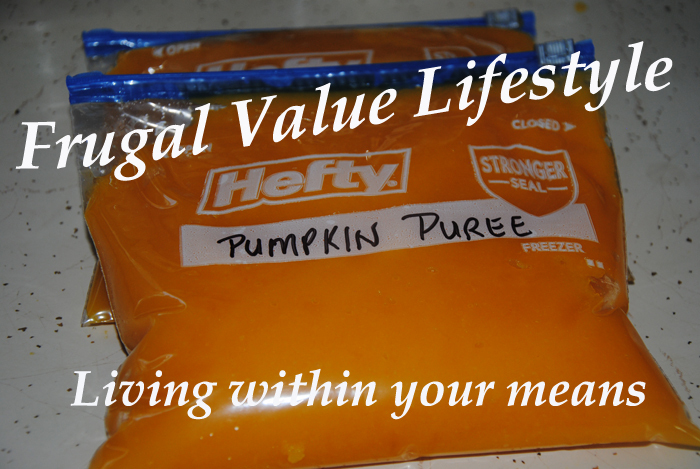 Use immediately in recipes or freeze in quart ziploc freezer bags. Lay flat for better storage. Now, what about those seeds?? Some have made beautiful necklaces out of them, some have shelled them for eating, and some have roasted them in their shells for snacking enjoyment. 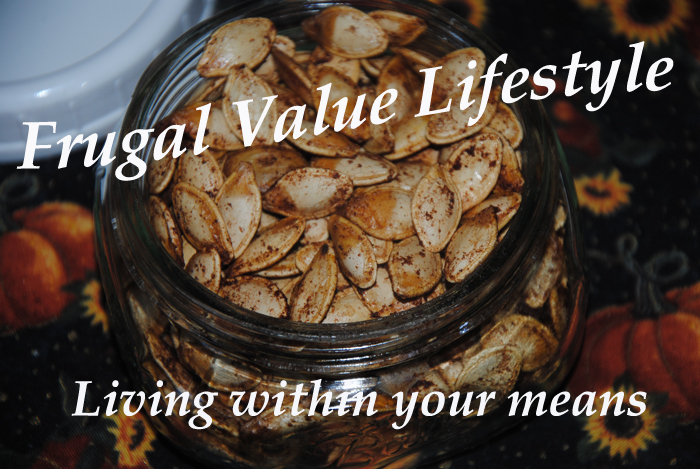 There are many recipes online that can share how to make roasted pumpkin seeds. Since I try not to avoid a high intake of salt, my method does not incorporate salt. But, if you are one to enjoy salt, consider sea salt as a healthier option. First I sprayed my cookie sheet with coconut oil, made sure it was well covered to prevent the shells from burning and sticking to the cookie sheet. In a bowl, after rinsing my seeds 4 times, I strained them, then put them in a bowl mixed with cinnamon. Since I do not measure “how much” I will estimate maybe a 1/4 – 1/2 tsp of cinnamon. If you decide to use salt, you can use the same amount as the cinnamon, yet no more than double what you used. Mix the seasonings with your seeds. Yes, the seeds are still wet from rinsing and draining. Lay them out in a flat layer on your greased cookie sheet. Bake at 350 degree F at 5 minute intervals, turning every 5 minutes for no more than 20 minutes. Twenty minutes was perfect for what I roasted. Whether it was because I oiled my pan well, or the shells were still moist, might be the reason. I’ve read a few other places where people have trouble burning their seeds. Utilizing the Slow Cooker (Crock Pot) – Making great meals for a crowd, the freezer, lunches and meals throughout the week. One of my favorite methods of cooking, most especially with the fall season now upon us with winter fast approaching, is in utilizing my Slow Cooker. It saves me valuable time at the end of the day when the family is hungry. In addition, depending on family size, meals prepared in this manner can provide additional meals that can either be frozen for later, or eaten throughout the week. The most valuable cost benefit that I have found is that you can utilize dried beans versus the more costly option of canned, as well as lower priced cuts of meat. Personally, I still like grass fed meat sources while taking advantage of the lower priced cuts. Due to personal flavoring along with the slow cooking method, the meat is tenderized and flavored nicely. The health benefit is that the lower cooking temperature in utilizing a slow cooker is that your nutrients are less likely to be lost as compared to cooking at high temperatures. In addition, as you add your own fresh ingredients and seasonings, you are aware of the nutritional benefit as you avoid the preservatives so commonly found in foods that you might find pre-made in a can or in the freezer. Please note: I am not a proponent of pre-made slow cooker seasoning packets. I found that they contain a great deal of salt that takes away from the natural flavoring along with ingredients I might not otherwise use (nor be able to pronounce). I would much rather utilize my own personal choice of seasonings and add a little salt (my preference is sea salt). I tend to salt lightly while cooking. This allows the individual to determine the amount necessary to satisfy his/her tastebuds. Many meals can be made in the slow cooker, ranging from soups, stews, roasts, sauces, desserts, breakfasts, and more. As a result, one has the ability to bring something healthy for lunch to work the next day, an easy meal option to be frozen or used for ready-made meal on a busy day within your week. In addition, when you have unexpected company, a meal prepared in the slow cooker provides the ability to share your meal with others. Of course, that is dependent upon family size. When expecting that your day will only get busy with family activities with different schedules, a slow cook meal will keep food hot and healthy for everyone as they arrive home at different intervals. 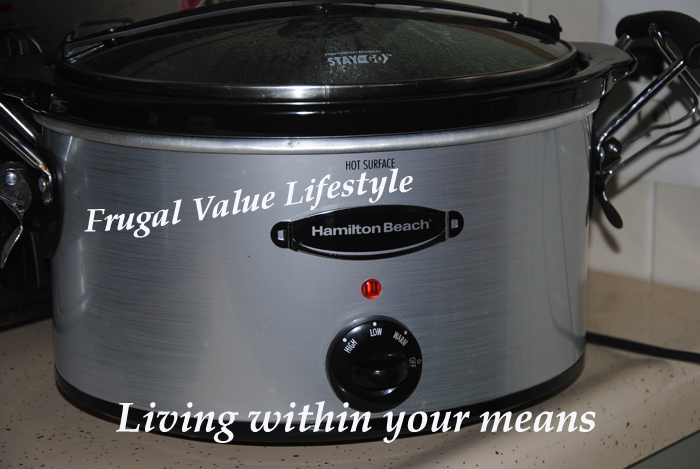 Slow cooking is a healthy way to feed your family and save money. From using garden vegetables and herbs to naturally fed sources of meat, one is able to make amazing meals that family and friends will enjoy. In addition, these meals are perfect for social gatherings, so be sure to keep your appliance clean and looking nice. I’m beginning to think I need to hint at acquiring a few more for those weekends I am in one of those moods for a cooking marathon. 🙂 Besides, wouldn’t it be nice to have a hot meal in one and maybe a peach cobbler or apple dessert in the other? NOTE: I personally do not like to leave my slow cooker on when I leave the house. I know that many others do. I just personally find that any appliance that produces heat to be a potential hazard if left unattended. I tend to utilize my slow cooker on the weekend or days in which I am home. If I have to run out for an errand, I either let a family member know it is on, or unplug my unit and reset it when I return. This is a picture of my nephew’s chickens that he raises for eggs. We used to have chickens when we lived in ME, but for now we rely on the local farmers and grocers for our source for chicken protein. Without taking into account the cost per pound for chicken, sometimes the best value for your dollar is purchasing a whole chicken that you will bake or cook within your rotisserie. I realize that buying the pieces makes like easy, and sometimes the cost makes it worth it. NOTE: Always shop with your health in mind first, buying quality brand cuts of meat. A healthier lifestyle saves on medical costs. But, have you opted for the whole chicken in order to get all that you can from this roaster? I enjoy utilizing my rotisserie, but also enjoy the oven baked chicken. With both options, you can get more than just an evening meal with possible left-overs for lunch or the next evening. With a 3-4 pound chicken I am able to serve my husband and I three – four meals. Of course, these meals are portioned sized allowing us to enjoy more vegetables, while not over consuming on protein. But what about “boring” repeat meals? It does not happen. Each evening or lunch, the chicken can be used in a casserole, sandwiches, or another dinner variation with different vegetables and side dishes. In addition to the meals, I am able to get at least four cups of chicken broth made from boiling the carcass in water and seasonings. No preservatives, no salt, etc. This provides enough broth to make a batch of soup, use in a casserole or a side dish of rice. When our three daughters were living at home, this size chicken would produce one full evening meal, leftovers for a casserole, along with the broth to make home-made chicken noodle soup. When I purchase boneless chicken breast, which is the only other type of chicken I purchase, I do not have the option to make broth. 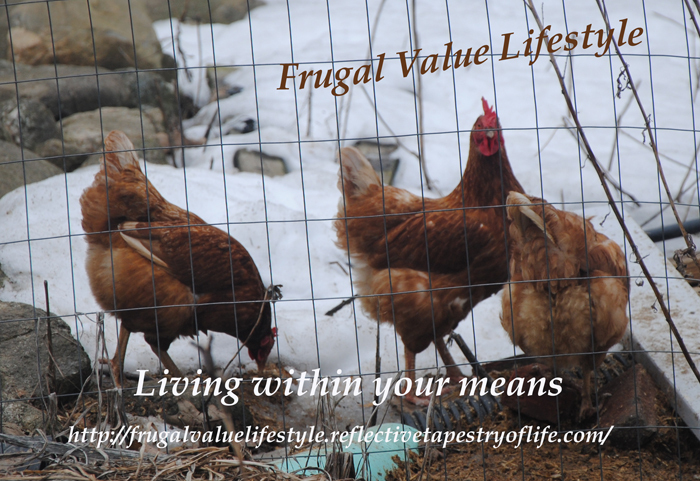 I still enjoy buying my chicken this way for the other meals I prepare, but when I need to stretch our grocery dollars, this is one option that makes sense. What do you do with your leftover chicken? Share here in the blog, as I would love to hear from you. We can all eat healthy on a slim budget.